experiencing medical condition that affects their judgment or abilities. Assume that all approaching traffic is out to get you until proven otherwise. The Responder Safety website has a lot of great training resources, videos and more for those men and women who put their lives on the line for our safety. The department has a working relationship with law enforcement, DOT (public Works/Highway) and other responders to roadway incidents. Apparatus is equipped with basic traffic control equipment including cones, flares/lights, and advance warning signs. New apparatus has rear stripping per NFPA 1901, 2009. 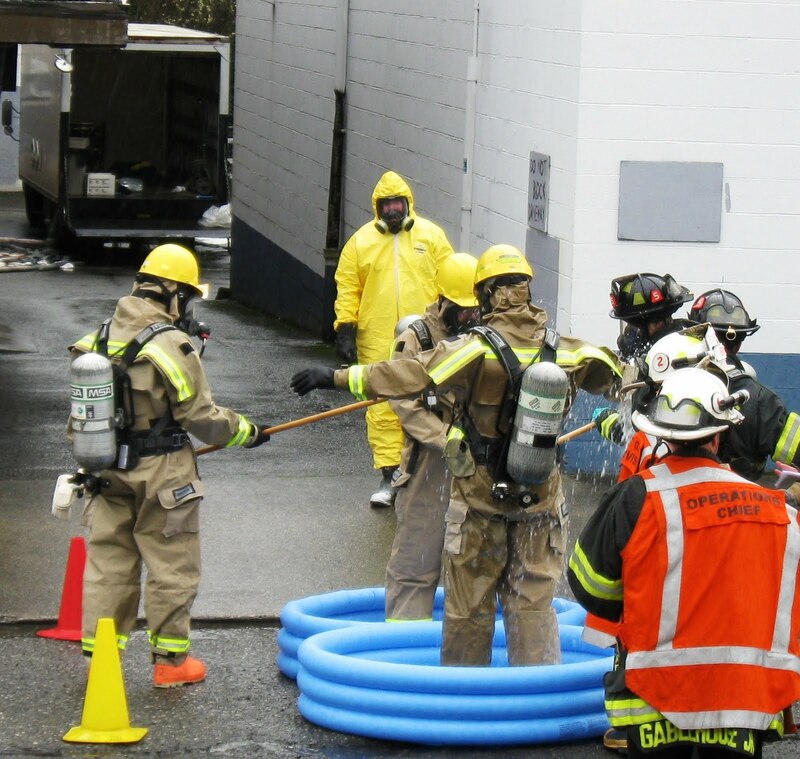 Department exploring or implementing retrofitting current apparatus. I live in a rural area. The two lane road from town to our home winds its way for about 5 miles through pastures, wooded areas and homes of all types and sizes. The road continues past our home into the next county and for many more miles before coming to the next town. As such, it is a popular road for other than motor vehicles; folks often ride their horses along the shoulder of the road, and bicyclists singly and in groups, are often seen. A friend told me of an event that happened this last weekend that captured my attention. He was driving his pickup along the road, in an area where the road is quite narrow, has blind curves and is clearly marked with a double yellow center line as a “no passing” zone. The lane is a typical rural road width of approximately 10 to 11 ft. Bicyclists were riding in tandem order, but traveling significantly slower than the posted speed limit of 35 mph. My friend said he slowed to about 15 mph as he approached the two bicycles. The rearmost of the two riders pulled as far to the right as possible at this point in the road – there is a steep drop off, just past the guard-rail which is located about 2 ft to the right of the lane side paint stripe (fog stripe). The lead rider, however, refused to pull over to allow the pick-up to pass, but instead remained in the left most portion of the lane, near the center line and slowed down even more. As the two bicycles and my friend’s pickup slowly made their way around the blind curve, they finally came to a place where my friend could see around the curve. There was no on-coming traffic, but, by this time, two other cars were also following close behind. The double yellow lane stripes ended at about this location, and the bicycle rider moved slightly to the right. My friend moved over the center line to pass the bicycle when, unexpectedly, the bicyclist again moved back to the left side of the lane. Even with abrupt action, my friend could not avoid the bicyclist and struck the rider on the left arm and shoulder with the right side rear view mirror of the pick-up. The bicyclist tumbled to the ground in the middle of the lane. How would you assess this situation? Who, if anyone was responsible for this collision? And lastly, what is the law about bicycles and motor vehicles sharing the road? RCW 46.61.755 Traffic laws apply to persons riding bicycles. (1) Every person riding a bicycle upon a roadway shall be granted all of the rights and shall be subject to all of the duties applicable to the driver of a vehicle by this chapter, except as to special regulations in RCW 46-61-750 through 46.61.780. Section 750 says, “ . . . It is a traffic infraction for any person to do any act forbidden or fail to perform any act required by . . .” the sections of the RCW that apply to bicycles. 46.61.758 requires the use of hand signals for turns or stopping, 46.61.760 essentially prohibits riding “double” except on two-seat bikes. 46.61.765 prohibits clinging to or being propelled by holding on to a moving motor vehicle. RCW 46.61.770 Riding on roadways and bicycle paths. (1) Every person operating a bicycle upon a roadway at a rate of speed less than the normal flow of traffic at the particular time and place shall ride as near to the right side of the right through lane as is safe except as may be appropriate while preparing to make or while making turning movements, or while overtaking and passing another bicycle or vehicle proceeding in the same direction. A person operating a bicycle upon a roadway or highway other than a limited-access highway, which roadway or highway carries traffic in one direction only and has two or more marked traffic lanes, may ride as near to the left side of the left through lane as is safe. A person operating a bicycle upon a roadway may use the shoulder of the roadway or any specially designated bicycle lane if such exists. (2) Persons riding bicycles upon a roadway shall not ride more than two abreast except on paths or parts of roadways set aside for the exclusive use of bicycles. The above RCW’s make it very clear that bicycles may share the road – they have equal access, BUT with that privilege comes responsibility to ride in a safe manner that does not put the bicyclist or other motorists in danger, and per 46.61.770 does not impede the normal flow of motor vehicle traffic on the roadway. Divers of motor vehicles also have the responsibility to look out for all other persons sharing the road, regardless of means of transport – horseback riding, bicycling or simply walking. The lessons learned from this event: be patient, and be courteous to other road users so we all can share the road, safely. What have been your experiences when sharing the road? Smarter Highways: What do you think? Washington State Department of Transportation has the new sign bridges on I-5 in operation. Mile 2.5: A mile from the trouble spot speed limit signs flash arrows intermittently. Green arrows instruct drivers to proceed in their lane, and yellow arrows mean exit the lane as soon as safely possible, because the lane is closed or blocked ahead. On August 19, 2010 the US Department of Labor announced that preliminary results show that workplace fatalities for 2009 are below 2008. These results show a decline in workplace fatalities in 2009 compared with 2008. Last year, 4,340 workers died from work-related injuries, down from a final count of 5,214 fatal work injuries in 2008. For more information, please check out the press release on the OSHA site. Developed by our allied partner AdvanceOnline Solutions, along with experts from the DOT Transportation Safety Institute, the courses cover the CSA 2010 Behavior Analysis and Safety Improvement Categories (BASICs). 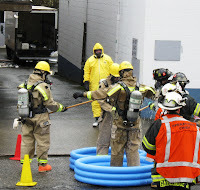 Visit our website for information and to register for our Online CSA 2010 classes and Online HAZMAT Transportation courses. When I was a kid, my older brother used to complain when I would copy whatever it was he was doing. Yes, as an annoying “little brother” I would imitate his laugh, or the way he would walk, or the way he would hold a sandwich - balanced on top of his outstretched fingers - just to see his reaction. Of course, we can all recall times in the school classroom when many students, who had not invested sufficient time in studying, would attempt to copy the answers from someone else’s paper. This action was always fraught with danger, not only from being caught, but from wondering if the person you were copying had studied any more than you had! When I became a parent, and our son made a similar complaint that his little sister was “copying” him, his mother and I would tell him that copying was really a compliment: the person doing the copying is really demonstrating they wanted to be just like the person being copied. We only realized that he had taken this advice to heart, when we caught him in the back yard feigning that he was eating dirt from the flower bed, knowing his three year old sister was watching. Our next discussion on this topic, emphasized that as the “big brother” he had the opportunity and the responsibility to set a GOOD example. We adults have probably heard, or maybe used the famous quote from the 18th century author, Charles Caleb Colton, “Imitation is the sincerest form of flattery.” As we tried to teach our children, instead of being annoyed, we advised that when someone copies us, we need to see the situation as a “teachable moment”, an opportunity to set a good example. Regardless of your job title, every day on the job, each of us has an opportunity to set a good example of working safely. Do you always operate equipment and machinery with all the factory guards securely in place? Do you always wear the appropriate PPE, such as hearing protection, even if you are only going to be in the noisy environment “ . . . just a few moments”? How about safety glasses, goggles or face shields? If your employees see you violating your company safety rules, what incentive do they have to not do the same? This also applies to the experienced workers: new workers always look to the “experienced” employee to see how things are to be done. Ask yourself; what lessons, what example, have I set today? There will always be copy cats out there, let’s make a sincere effort to give them something good to copy. Securing children properly in age and size appropriate child safety seats — in the backseat of the vehicle — is the most effective thing parents and caregivers can do to protect them in the event of a crash. In fact, in motor vehicle crashes, child safety seats reduce the risk of fatal injury by 71 percent for infants, 54 percent for toddlers (USDOT NHTSA Center for Statistics and Analysis) and 59 percent for children in boosters (Children’s Hospital for Philadelphia). Nationally among child passengers under age 5, child restraints saved the lives of an estimated 244 children in 2008 alone. Even so, motor vehicle traffic crashes remain the leading cause of death for children age 3 and older. ♦ Adjusted to fit the child securely. Certified Child Passenger Safety Technicians are available to help. ESC offers FREE car seat check ups at our office in Seattle. to schedule an appointment, email Safety Norm or call our office 206-382-4090. In Oregon? Call the ACTS Oregon Child Safety Seat Resource Center at 877-793-2608 or 503-643-5620. In other areas, find FREE check up locations and events online. Borrowed from our friends at ACTS Oregon. I have a tickler file – I put things in it, to remind me to do something at an appointed date and time. Today’s tickler file reminder was to perform my annual home emergency preparedness review. Are large items close to the bed? Dressers or other tall furniture can topple over during a ‘quake. Glass items on those pieces of furniture and even glass from windows or picture frames can cause injury. Heavy potted plants – particularly those suspended from the ceiling, in any room – can come loose and cause damage to anyone near. These can be replaced with lighter pots and the suspending hook should be a king that can be positively closed to keep the suspended item in place. Check storage cabinets and shelving: place heavier items on the bottom shelves and lighter items on the top shelves. Secure tall furniture to the wall studs to prevent them from toppling over. Commercial gels, and other similar products can secure displayed items such as glassware to the shelf, so they don’t come flying off when things start shaking. Check to insure your water heater is securely strapped to the wall studs. This will prevent it from tipping, and if the water supply is compromised, this is a 30 to 50 gallon supply of emergency water. Check the garage or similar storage areas: store liquid weed killers, pesticides, or other flammable liquids away from heat sources. Do you know how to and have the tools readily available to shut off your utilities – water, natural gas, electricity – in the event of leaking from damage incurred during the ‘quake? Check your cabinet latches: replace magnetic latches with a type that will positively hold, keeping the cabinet contents inside. Check the yard for dead tree limbs that could snap off and damage the roof of your house. Re-arrange the furniture, if necessary, so that if they did tip they would not block an evacuation route or access to your emergency supplies of home fire extinguisher. Check your 72 hour kit for expiration dates of food and stored water supplies. If you don’t have a kit, get one, appropriately sized for your family and don’t forget to have supplies for your pets, too. The bottom line is simply, any preparations you make, can be useful in not only an earthquake event, but will be helpful in any emergency situation. A final suggestion: do you have current First Aid / CPR training? 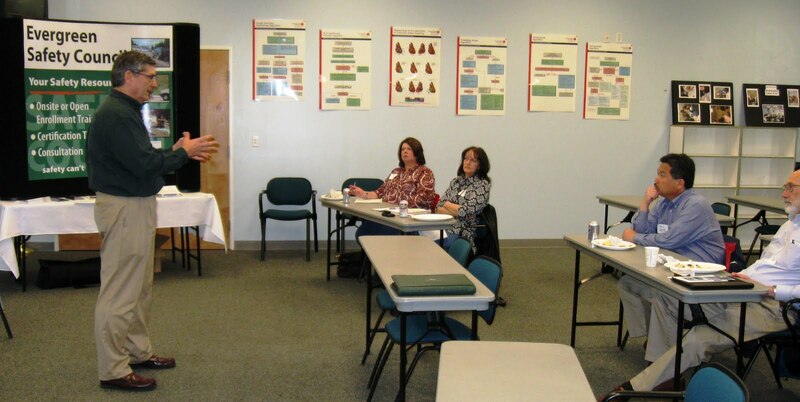 If not, one source for training is Evergreen Safety Council, check out the schedule for classes on our website. The Contractor shall ensure that a competent person as identified in the MUTCD selects the appropriate high-visibility apparel suitable for the jobsite conditions. High visibility garments shall be in a condition compliant with the ANSI 107-2004 and shall be used in accordance with the manufacturer recommendations. Guidance: Neither work activity nor storage of equipment, vehicles, or materials should occur within a buffer space. Option: A longitudinal Buffer space may be placed in advance of a work space. Does require that a flagger station is far enough in advance of the work space so that the road user can stop or divert before entering the workspace the WAC uses the previous Buffer space chart from the 2000 edition of the MUTCD (shorter distance). Hang Up and Drive, take a virtual ride along with the State Patrol as they discuss the dangers of cell phone and texting while driving. On June 10, 2010, driving while texting or holding a cell phone to your ear became a primary offense. The Washington State Patrol (WSP) has produced a short video that takes you on a ride along with Sergeant Freddy Williams as he discusses why distractions, such as texting or talking on the cell phone, are so dangerous. The Hang Up and Drive video talks about the dangers motorists face when they are texting and talking on the cell phone while driving. For more information about driver safety and other WSP informational videos, please visit the Hot Topics section on the WSP website. The U. S. Department of Transportation’s Federal Motor Carrier Safety Administration (FMCSA) is pleased to announce the next step in the phased rollout of Comprehensive Safety Analysis 2010 (CSA 2010). In April 2010, FMCSA launched the CSA 2010 Data Preview Website which allowed commercial motor vehicle carriers to view an inventory of their safety performance data by the new Safety Measurement System’s (SMS) Behavior Analysis and Safety Improvement Categories (BASICs). On August 16, 2010, FMCSA will update the Data Preview Website by providing carriers with an assessment of where they stand in each BASIC based on roadside data and investigation findings. The SMS’s seven BASICs are Unsafe Driving, Fatigued Driving (Hours-of-Service), Driver Fitness, Controlled Substances/Alcohol, Vehicle Maintenance, Cargo-Related and Crash Indicator. The BASICs will replace SafeStat’s Safety Evaluation Areas (SEAs) in December 2010, and this early look gives motor carriers an opportunity to understand and address their safety compliance issues right away. The measure of exposure will be changed from Power Units (PUs) only to a combination of PUs and Vehicle Miles Travelled (VMT) in the Unsafe Driving BASIC and Crash Indicator. In addition, these two BASICs will change from using PUs as a safety event grouping (formerly referred to as peer grouping) to using the number of crashes for the Crash Indicator and the number of inspections with a violation for the Unsafe Driving BASIC. The Agency will employ a more strategic approach to addressing motor carriers with a history of size and weight violations rather than counting these violations in the Cargo-Related BASIC; the new approach will include alerts to roadside inspectors when carriers have a history of size and weight violations. FMCSA’s 30-month field test of CSA 2010 has drawn keen interest from the trucking industry, including trade publications. Recently one of these publications reported preliminary findings provided by FMCSA’s independent evaluator, UMTRI, that indicate that while the majority of the BASICs have a strong relationship to future crashes, two of the seven – Driver Fitness and Cargo-Related - do not. The question was raised whether these findings would delay implementation. In the interest of safety, and based on promising field test results, FMCSA’s implementation of CSA 2010 will continue according to its published schedule available at: http://csa2010.fmcsa.dot.gov/about/csa_when.aspx. The SMS was designed to: (1) Identify high-risk motor carriers for priority intervention; those that have a greater propensity to be involved in future crashes, and (2) Identify motor carriers with patterns of on-road performance and compliance issues for intervention. SMS does both very well. With respect to identifying high risk carriers, FMCSA effectiveness testing results demonstrate that those carriers that SMS identifies as “high-risk” have much higher future crash rates than those carriers not designated as high risk. Additionally, the effectiveness testing shows SMS identifies a group of carriers with higher crash risk than the system currently in use known as SafeStat. SMS clearly identifies motor carriers with compliance issues as well, regardless of whether those compliance issues are linked to future crash risk through effectiveness testing. 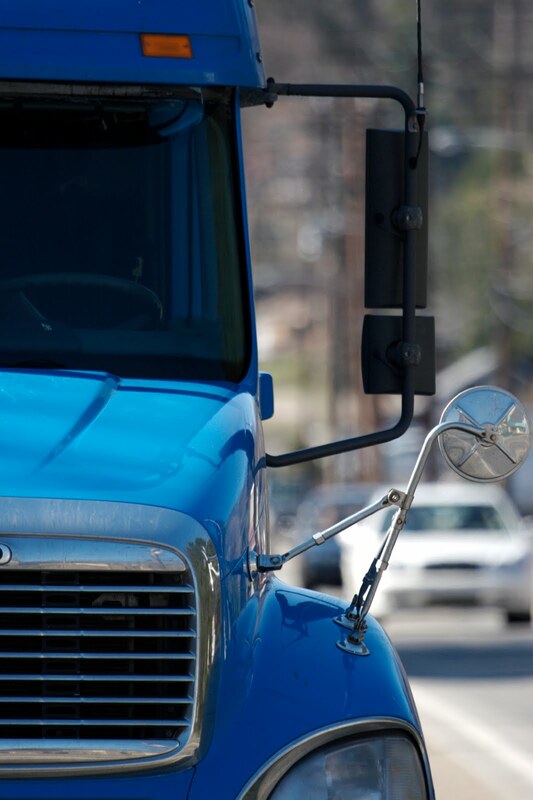 Congress has been clear that the FMCSA is a compliance and enforcement agency. 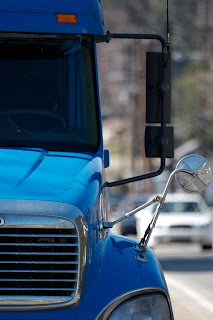 While the effectiveness testing may not establish a relationship with future crashes in the Driver Fitness and Cargo-Related BASICs, FMCSA, as well as industry, has an obligation to ensure compliance with the regulations that contribute to these two BASICs. These two BASICs include being properly licensed, carrying medical cards to allow verification that a driver meets the medical qualification standards, adequately securing cargo, and properly packaging and handling hazardous materials. UMTRI’s preliminary findings are in line with FMCSA’s effectiveness findings in terms of future crash risk. In response, FMCSA has adjusted how it identifies carriers for investigation so that the BASICs that have the strongest relationship to future crashes receive the most emphasis. In this way, FMCSA will address those carriers with the highest propensity for future crashes as well as those with the strongest patterns of noncompliance. Remember for those needing training on the CSA 2010 BASICS as well as other DOT topics, ESC has a new on-line set of courses available at www.esc.org. Evergreen Safety Council does not issue citations. We are here to assist your company and employees in Safety and Health prevention and compliance. On-site safety training is designed to be cost-effective; with the goal of making the cost less (per person) than if you were to send your employees to an open enrollment. For more information contact our office at (800) 521-0778 or email esc@esc.org. I recently was given some statistics from a friend who works for King County Public Health. I take a walk at lunchtime, most days when I’m at my office. So, what do these two sentences have to do with each other? Although I’m a safety professional, with years of experience in driver safety programs . . . I’m a pedestrian on those lunch hour “hikes”. Crossing the street in a busy city is always somewhat hazardous: some folks are distracted and just don’t see you. And, at times, we pedestrians don’t always see or hear traffic approaching the crosswalk. (NOTE: new cars and particularly hybrid cars make very little sound when pulling away from a stop at usual in-the-city speeds!) Pedestrians need to be especially watchful for these quiet cars. I always knew the “fact” to be true, but didn’t have a clue as to the “real numbers”. If we would slow down, and drive just a little slower - the severity of vehicle pedestrian collisions would be reduced, and many lives would be saved. In a 20 mph collision, approximately 30% of pedestrians struck are uninjured, about 5% die, and the remainder sustain an injury. At 30 mph, approximately 5% of pedestrians struck are uninjured, about 45% die, and the remaining 50% sustain an injury. At 40 mph, no one escapes without an injury, and 85% are killed. At 50 mph, there is a 100% fatality rate for the pedestrian who is struck. The laws of physics are inescapable: in a collision between a ton or more of steel versus 150 to 200 pounds of human – the human is always the looser. Please slow down when driving near pedestrians, we’ll all be a lot safer is we do.